While wages usually increase when productivity increases, real wages in Israel have remained relatively stagnant over the past decade, despite a rise in productivity. Researcher Gilad Brand finds that this is due to the fact that consumer prices – particularly for food and housing – have increased to a greater degree than the prices of produced goods. Generally, real wage increases are tied to increases in productivity (defined as the output of goods and services per hour of labor) – as productivity goes up, so do wages. In theory, this should give workers more money to spend, enabling them to buy more goods and services as consumers. However, there has been a surprising phenomenon in Israel over the past fifteen years. While labor productivity per worker rose by 15% between 2001 and 2015, real wages in the business sector remained relatively similar from the beginning to the end of this period. 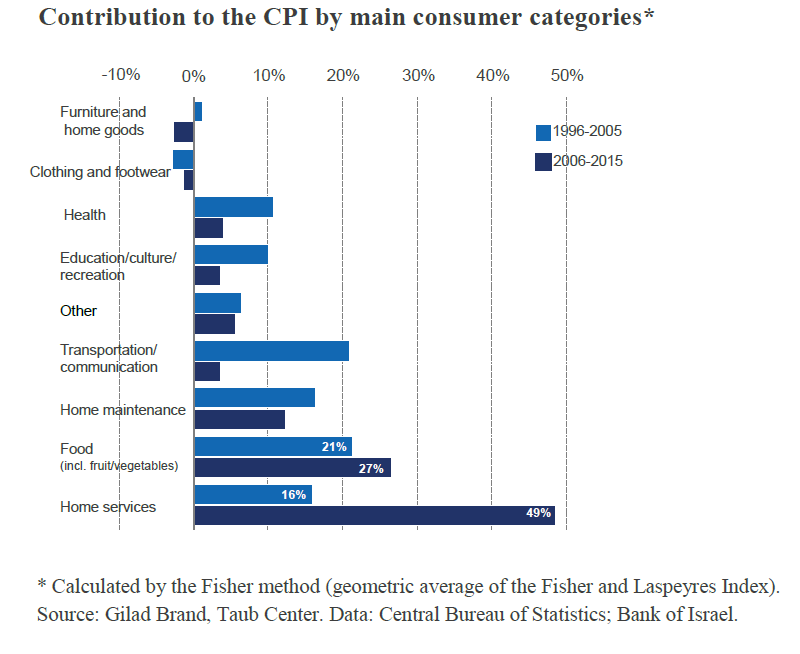 In a recent Taub Center study, Researcher Gilad Brand finds that the weakening of the link between productivity and wages was caused by the rapid increase in consumer prices relative to the market value of the final goods and services produced in Israel’s economy. Among the reasons commonly given for the stagnation in wages is that the fruits of economic growth, fueled by increased productivity, do not trickle down to most workers because their bargaining power has weakened. Brand refutes this claim and shows that workers’ “share of the pie”– the portion of Israel’s GDP going to workers – has in fact remained relatively stable over the past few decades. What then can explain the weakening correlation between productivity and wages in Israel? In his study, Brand examines the differences between the basket of goods workers produce and the basket of goods they consume. The important distinction here is that what workers produce is directly correlated with productivity, whereas their real wages are impacted both by what they produce and the cost of what they consume. Even if workers’ nominal wages increase, this only leads to an increase in real wages if the rise in nominal wages was higher than the rise in consumer prices. Over the past decade, inflation for the basket of goods that workers produce has increased by roughly 1.5% per year. In contrast, inflation for the basket of goods that workers consume has increased by about 2% per year. After a few years, this has accumulated to a substantial gap between the two. The growing gap between production and consumer prices since the mid-2000’s is rooted in the appreciation of goods that are typically bought by households in higher quantities, but represent a smaller share of what is produced; namely food and housing. In recent years, the share of household expenditure on food has been about 16%; yet, on the production side, the food and agriculture industry together constitute only 4% of what the country produces. Similarly, 25% of households spending goes to housing, yet the construction industry’s contribution to production makes up no more than 7% of Israel’s GDP. Thus, for a typical Israeli household, food and housing make up 41% of household expenditure. Both of these items became noticeably more expensive in the mid 2000’s as there was a spike in food prices beginning in 2006and housing prices began to rise in 2009 (and have continued to rise since). The increase in housing and food prices alone contributed about 70% to the increase in the price level of the basket of consumer goods (CPI) over the past decade. 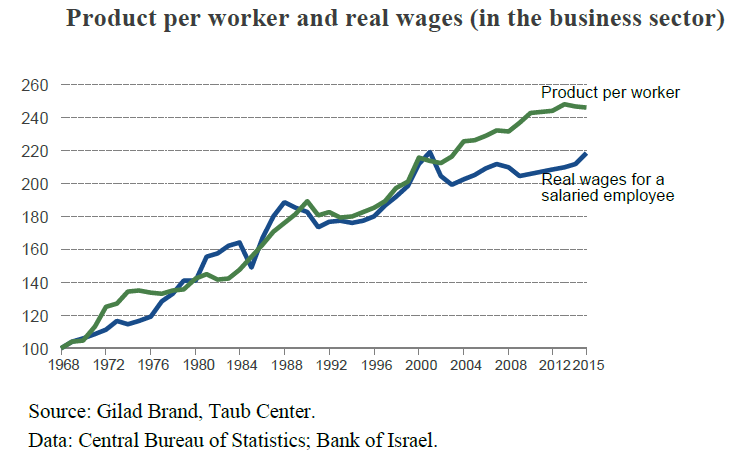 Brand concludes that productivity and wages in Israel are still very strongly correlated. However, the benefit from the rise in productivity in the past decade was offset by rising food and housing prices for Israeli consumers. Therefore, workers’ standard of living has not increased during this period. Because the gap between production and consumer prices was largely triggered by housing prices, there is a notable difference between Israelis who owned homes prior to 2009 and those who rented. For those who owned homes prior to 2009, real wages have indeed increased more or less with the increase in productivity. However, real wages for those who were not yet homeowners in 2009 have experienced very slow growth. This trend has an impact on consumption, as well. The Bank of Israel found that those who rent apartments, in line with the stagnation in their wages, have decreased their consumption since housing prices spiked. In contrast, those who own apartments have actually increased their consumption. Interestingly, this division exists across generational lines, as well. Older generations, who were more likely to have owned a home prior to 2009, are better-off and have seen more of an increase in their real wages. Younger generations, on the other hand, who are not homeowners and are subject to rising rental costs, have experienced relative stagnation in their wages. Since the publication of this study in September of 2016, new data shows that the picture has flipped in the past two years. In earlier years, consumer prices were increasing faster than prices of produced goods and services, leading to a gap between the two. However, since the last quarter of 2014, the reverse phenomenon has occurred, thereby closing the gap between the two price indices. This turn of events is not due to a reversed trend in housing prices which, in fact, have continued to rise. While there may be additional reasons, Brand believes that the gap has closed in part because oil and commodity prices have offset the rising housing costs. Both oil prices and commodity prices have dropped substantially in the past two years, and these have a stronger impact on consumer prices than on Israel’s GDP. In conclusion, the gap between the prices of the basket of goods Israeli workers produce and the basket of goods they consume grew due to the fact that goods that Israelis primarily consume – particularly, housing and food – became much more expensive. However, recent developments show that this trend has reversed in the past two years, closing the gap between consumer and production prices. This has resulted in a cumulative increase of about 7% in real wages over the past two years, after a long period of very slow wage growth.